The Best Party blogs from thousands of top Party blogs in our index using search and social metrics. Data will be refreshed once a week. 2.16 Michelle's Party Plan-It - Party Ideas, Crafts, Recipes and More! 2.29 B. Lovely Events - Tips And Trends For Life's Celebrations! 2.62 Party Affairs - Your one-stop directory to all things party planning. Party newsletter is a comprehensive summary of the day's most important blog posts and news articles from the best Party websites on the web, and delivered to your email inbox each morning. To subscribe, simply provide us with your email address. About Blog Kara Allen - Party designer, author, dessert stylist & creator of Kara's Party Ideas- THE place for all things PARTY! Thousands of party ideas, supplies, recipes & more! Facebook fans 413,356. Twitter followers 30,158. Palo Alto, CA About Blog The best place for party ideas, party supplies, party crafts and recipes. Browse our Frozen parties, Minecraft parties, baby showers, bridal showers, and more! Facebook fans 142,361. Twitter followers 24,439. San Francisco About Blog Oh Happy Day is updated daily with inspiring and useful lifestyle ideas and products. Some topics included are: parties and weddings, home decor, fashion and personal style, crafting, creative projects, and other cool stuff. Facebook fans 301,971. Twitter followers 31,020. Orange County, CA About Blog A blog about fun party inspiration, DIY projects, recipes, and more. Facebook fans 3,874. Twitter followers 645. Florida, USA About Blog A blog about parties, party styling, event design, diy, and party decor. We are a party and event styling company in South Florida, nearby Boca Raton, Delray Beach, Parkland, Coral Springs, West Palm Beach, and Fort Lauderdale, specializing in Birthday Parties, Bridal Showers, Baby Showers, Small Weddings, and MORE! Facebook fans 10,455. Twitter followers 1,567. Mountain View, CA About Blog Wedding, birthday, baby shower, and party inspiration zone for creative themes, DIY projects, stylish new products, party planning tips, and so much more. Facebook fans 48,313. Twitter followers 9,955. About Blog A creative destination for over 10,000 daily party and lifestyle readers worldwide, we share amazing party ideas, free party printables, design inspiration, party crafts, tutorials, party recipes and eye candy galore, to help readers style amazing parties and events, for any of life's special celebrations! Facebook fans 88,112. Twitter followers 5,779. San Diego, CA About Blog Inspiration for all of life's celebrations! We share creative party themes, DIY projects, recipes, resources & helpful tips for celebrating in style. A blog by Jenn Sbranti. Facebook fans 447,617. Twitter followers 17,194. Telford, Shropshire, England About Blog This Blog features Hen Party games & inspiration and wedding ideas and planning tips. Facebook fans 13,576. Twitter followers 2,431. About Blog Sometimes it seems like everything adorable is for little girls. But parents of boys want to have some fun too. Spaceships & Laser Beams offers parties, crafts and food ideas that boys - and their moms - will love. Consider us a no princess zone. All of our printable products are created by a collective of talented, professional designers. Facebook fans 1,345,763. Twitter followers 115,766. Los Angeles About Blog Inspiration for kids' birthday parties, nursery decor, baby showers, maternity photography and family life! Facebook fans 13,315. Twitter followers 1,660. Charlotte, NC area About Blog Anders Ruff is the ”go to” shop for unique and stylish printable invitations, decor, printables and party accessories. Anders Ruff equips the modern hostess with the beautiful details needed to make their events stylish and memorable. They also offer inspiration for the entire party planning process via the blog. Facebook fans 43,280. Twitter followers 8,051. About Blog Get ideas for parties, crafty tutorials and printables for decoration. Facebook fans 17,077. Twitter followers 2,657. Richmond, VA About Blog Chris Nease is a freelance stylist & writer on the subject of parties & home entertaining. Get inspiration for all occasions, including decor, recipes, tips, & easy projects. Facebook fans 25,059. Twitter followers 6,581. Adelaide About Blog Smart Party Planning is about helping you make the most of life's little moments in the easiest way possible. Smart Party Planning is FULL of helpful ideas and easy tutorials that you will want to read, share and refer back to all the time. Facebook fans 2,435. Twitter followers 1,356. 16. Michelle's Party Plan-It - Party Ideas, Crafts, Recipes and More! California About Blog Welcome to Michelle’s Party Plan-it! Here you will find a large variety of hand crafted party ideas and inspiration to help you plan the perfect celebration, big or small! Facebook fans 11,798. Twitter followers 1,157. About Blog I am a Party Designer who help moms and parents to create amazing and inexpensive parties at home. I also design and create high quality Clip-Arts for crafts, home projects, school projects and much more! In this blog you will find information about the same. Facebook fans 320. Twitter followers 446. About Blog Halfpint Design is a children's party planning site. Ideas for themes, activities, menus, and decor. Holiday decor and printables. Facebook fans 395. Twitter followers n/a. Seattle About Blog Easy to follow tutorials of fun and easy cute holiday food, sweet treat and party ideas for Halloween, Christmas, Thanksgiving, Easter and special occasions. Facebook fans 108,460. Twitter followers 521. Colorado About Blog Get ideas on party decoration, easy party recipes, arty themes, party supplies and more! Facebook fans 25,570. Twitter followers 346. Sydney, New South Wales About Blog Australia's source for party planning and ideas. The ultimate spot for finding party ideas, inspiration, suppliers and party planning tips. Browse our party magazine and blog for themes, trends, DIYs and more. Find local suppliers and tips to make simplify your planning. Facebook fans 16,654. Twitter followers 81. About Blog Andressa Hara is the party stylist behind Twinkle Twinkle Little Party & Twinkle Twinkle Little Party Magazine – two wonderful sources for all things pretty and party related. Facebook fans 10,939. Twitter followers 420. About Blog One Stylish Party offers designs and inspiration for entertaining in style. Fabulous real parties, handmade decorations, custom printables, DIYs & more! Facebook fans 3,361. Twitter followers 364. About Blog Get your party inspirations here! A place for birthday party inspirations for girls, boys, teens & adults! Decoration, game & activity, party favor ideas! Facebook fans 11,426. Twitter followers n/a. Dallas, TX About Blog Check out our blog for the latest real weddings, and events by Pop Parties!With Pop Parties, we'll make any event a celebrated success, capturing the spirit of the occasion. Wedding Planning and Event Design. Facebook fans 967. Twitter followers n/a. Westbury sub Mendip, Wells, UK About Blog Party Packs features Inspiration and ideas for your parties, events, weddings and celebrations. If party supplies are what you are after, we have it all, from a wide range of ideas for any party or event. Facebook fans 28,754. Twitter followers 3,292. Facebook fans 151,706. Twitter followers 15,777. California About Blog Repurposing Ideas, Trash to Treasure & Craft Ideas by DIY Inspired. Your source for creative inspiration for theme parties, home décor, DIY home improvement and DIY ideas. Facebook fans 26,609. Twitter followers 17,354. 29. B. Lovely Events - Tips And Trends For Life's Celebrations! United States About Blog B. Lovely Events Is A Site Where Users Can Find Daily Tips, Trends, Ideas, And Inspirations For Celebrations, Parties, Events And Weddings. Facebook fans 15,790. Twitter followers 1,524. Facebook fans 4,279. Twitter followers 820. Facebook fans 3,971. Twitter followers 114. Dublin, London About Blog The Hen Planner is a resource to help you plan the perfect hen party. Daring to be different, we love everything stylish, unique and fun and incorporate this into our hen parties. Facebook fans 34,078. Twitter followers 5,971. Gilbert, AZ About Blog Over the last 5 years Rebecca has poured her creativity into running a shop, blogging about DIY projects, designing products & coming up with new printables ideas. Make & Do Studio is a new adventure for Rebecca to wrap all of her talents into one creative outlet. Facebook fans 11,935. Twitter followers 2,225. About Blog Homemade Parties is your go-to place for inspirations on DIY parties and celebrations. Anyone can throw a memorable and stylish bash, so go ahead and make one yourself! All you need is a little bit of effort, a lot of love, and of course, a blog that will provide you with easy-to-do ideas and a showcase of real homemade parties to prove it can be done! Facebook fans 5,951. Twitter followers 19. Indiana, USA About Blog Shindigz is the premier celebrations solution for creating special, memorable parties with unique personalized and well designed products, always new selection and a more helpful, collaborative shopping experience built around the widely varying needs and time constraints of our customers. Facebook fans 165,145. Twitter followers 21,199. U.S.A. About Blog Welcome to The House of Bachelorette Blog - your home for Modern Bachelorette Party Tips, Ideas, trends, fashions & more! Plan the perfect Bachelorette party with the help of the experts at The House of bachelorette! We can help with everything from the party timeline, decorations and theme ideas, to amazing DIY party favors! Facebook fans 17,797. Twitter followers 1,372. About Blog Get tips, advice, parties ideas, holidays and DIY Projects form Paige's Party Ideas. Maryland About Blog Ideas for your beautifully personalized birthday parties and baby showers.Heather Dalton and the team at Chickabug are proud to offer a wide variety of beautifully designed paper goods and printables for parties. When you're planning an event, our personalized products will help you make it special - love is in the details! Facebook fans 32,775. Twitter followers 722. About Blog With a love & passion for all things children's parties, Little Wish Parties Blog is a pure childrens party blog that wishes to inspire you to create the perfect day your little ones wish for. It features gorgeous childrens parties and party styling inspiration from some of the industries leading stylists, DIY hints and tips, planning and ideas for the latest party trends. Facebook fans 9,371. Twitter followers n/a. Bournemouth About Blog At Creative Party Themes you'll find ideas to help plan adult party themes, teenage parties, college events and a wide range of kids' birthday parties. Facebook fans 1,907. Twitter followers 195. New York City About Blog We specialize in styling big events for small spaces. If you are looking to celebrate an engagement, birthday, shower or simply inviting friends over for a festive brunch—we offer the perfect entertaining solutions to fit your needs! Facebook fans 3,942. Twitter followers 566. UK About Blog Looking for hen do ideas? Subscribe our blog for unique hen ideas, hen party games & useful planning advice. Facebook fans 11,395. Twitter followers 1,448. About Blog Life's Little Celebration is the hub for all things celebrating little ones! Be inspired by the blog where stylish party supplies have been curated and showcased for you to suit a variety of kids party themes and celebrations. Facebook fans 12,378. Twitter followers n/a. About Blog Wants and Wishes is a printable Party & Wedding Invitation shop with parties for all levels of crafters! We also do full custom collections and items. Facebook fans 2,887. Twitter followers n/a. About Blog Through the eyes of your friends & family, view the entire wedding experience from Engagement Parties to Bridal Showers, Rehearsal Dinners to Receptions! Facebook fans 438,976. Twitter followers 13,014. Maryland About Blog Moore & Co. Event Stylists consists of a group of experienced Baltimore wedding planners that specialize in creating signature weddings and special events! Facebook fans 1,477. Twitter followers 154. About Blog All About Party Bags specialise in traditional party bags and fillers for kids parties. We have a great range of filled and empty party bags that are ideal for birthdays, weddings and other special occasions when you want to give out party toys. Facebook fans 2,169. Twitter followers 2,251. Sydney, Australia About Blog This is a blog for party planners searching for birthday party ideas, party themes, party supplies and party decorations. Facebook fans 3,124. Twitter followers 154. About Blog We're a DIY & party inspiration blog. We feature easy party guides, accessible DIY projects, and practical styling advice to make it all happen! Facebook fans 123. Twitter followers n/a. Melbourne About Blog To be part of creating special memories from providing boutique, retro and different party and hospitality wares, candy - also sourcing gorgeous products for homewares and toys, products that are different, stand out and classical. Bespoke party and homewares. Wares that are great for your events or are unique for serving your food and drinks. Facebook fans 60,554. Twitter followers 1,798. Atlanta About Blog Our mission is to create a resource for the best party ideas & supplies and to be a creative inspiration for you to make the most out of the special events in your life! Facebook fans 3,776. Twitter followers 1,372. About Blog Inspiration for easy and modern home parties and celebrations. Everyday Celebrations, Kids Parties, Holiday Parties, Home Entertaining Tips and Advice. Facebook fans n/a. Twitter followers 2,689. NY Tri/State About Blog This is my blog where I talk about the different events I planned, as well as my experiences with the clients, birthday party ideas. The Party Muse, LLC is an event planning firm that specializes in children’s events and candy buffets. Facebook fans 2,867. Twitter followers 1,503. United States About Blog Bachelorette party planning can be fun, quick and stress-free when you use BASHelorette to plan the big night out! Facebook fans 4,821. Twitter followers 309. Philippines About Blog Party Magic is the premiere destination for anyone who needs help in planning and decorating her party. Party Magic offers premium party styling services, utilizing modern aesthetics and styling elements (such as pom poms, lanterns, bunting flats, etc.) to create that perfectly chic party. Facebook fans 26,152. Twitter followers n/a. Atlanta, GA About Blog Parties for Pennies gives you ideas, tips, DIY projects & great recipes that will keep change in your pocket & help you party on! Facebook fans 4,662. Twitter followers 1,169. About Blog Party Ideas, crafts, recipes for everyday celebrations! Facebook fans 342. Twitter followers 57. Facebook fans 984. Twitter followers 808. About Blog Pump It Up is where every day’s a party. Whether you’re looking for the best 100% private kids birthday party or bounce house fun, we’ve got you covered. Facebook fans 2,180. Twitter followers 1,931. Gurgaon, India About Blog We are a one stop shop for all your requirements for a party, celebration, or a get together. We are India’s online platform for all your party essentials. Facebook fans 4,461. Twitter followers 116. About Blog Acting upon a stroke of inspiration and starting with nothing, I got into the events industry. Before that, I was working in the corporate world and I thought I would settle in as an employee for the rest of my life, but my dream was to become what I am today, an event stylist. I didn't have any formal training but what I had was inspiration. 62. Party Affairs - Your one-stop directory to all things party planning. Sydney About Blog Party Affairs simplifies the party planning process by acting as the ultimate party planners directory. At Party Affairs, you can find florists, gifts, caterers, entertainers, party hire, venues and more for any type of an event you want to plan. Facebook fans 7,135. Twitter followers 204. About Blog Blog about party planning and party ideas. Get latest and best party planning tips. Read all about trendiest parties. Facebook fans 67. Twitter followers 4. About Blog Hello my name is Emma and this is my blog. At Peek-a-Boo Party Bags we understand how busy parents are and it is our aim to take some pressure off putting on birthday parties. We supply readymade party bags, with quality treats for children. It is as easy as making the order and awaiting their arrival. Here you can find information and ideas for birthday parties, recipes for children's birthday cakes, ideas for birthday presents, fun birthday games and more! Facebook fans 175. Twitter followers n/a. About Blog DIY Birthday Party Ideas and Printables. Cinderella Food Cards, Monster Food Cards, Pink Zebra Food Cards, Care Bears, Mermaid, Snow White, Mickey Mouse, Elena of Avalor, Jungle Book, Little Mermaid, Tangled, Zootopia, Birthday Party Lights, Stincel and Ringlet. Facebook fans 26. Twitter followers 2. About Blog Mint Event Design is an event styling firm in Austin, TX specializing in customized and themed parties for any event, dessert tables and unique rental items. Facebook fans 7,831. Twitter followers n/a. LA About Blog Los Angeles party planner for Bat / Bar Mitzvahs, wedding planning, themed kids' birthday parties, tween and teen parties, and corporate event planning. Facebook fans 183. Twitter followers 160. 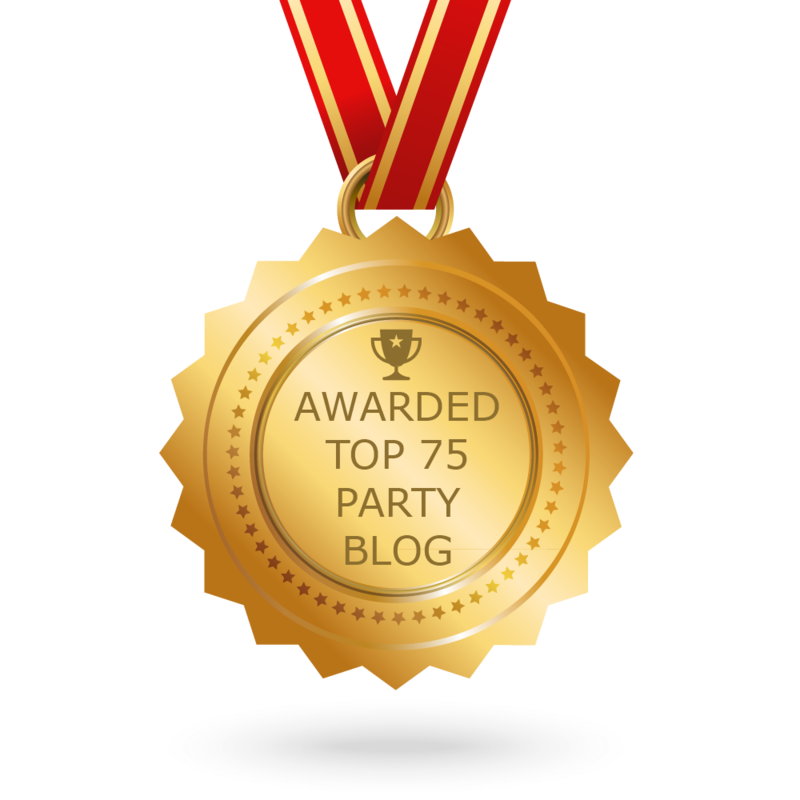 CONGRATULATIONS to every blogger that has made this Top Party Blogs list! This is the most comprehensive list of best Party blogs on the internet and I’m honoured to have you as part of this! I personally give you a high-five and want to thank you for your contribution to this world.